Downtown Durham recently had a gem of a store open: Rose’s Meat Market and Sweet Shop is part butcher shop, part sandwich shop, and part pastry shop. I had the best ice cream sandwich of my life the last time I stopped there, and I also picked up a couple of ginger caramels that were made with lard (from their butcher shop, I assume). 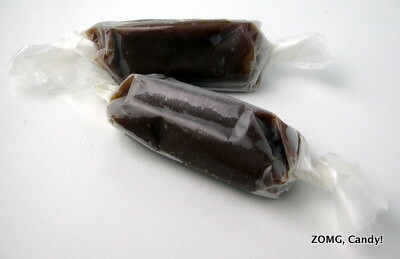 The generously sized caramels were 75 cents each and came wrapped in wax paper. They were soft and sticky with a long-lasting chew. 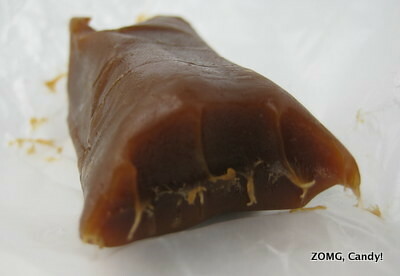 The caramels stuck to my teeth a bit but eventually melted away – no need for teeth picking here. I couldn’t tell that they were made from lard rather than from butter. 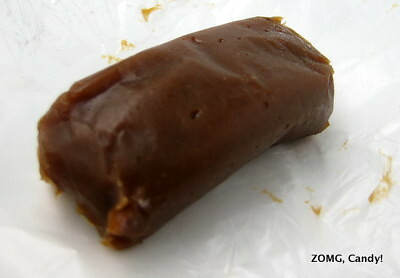 Though they did lack a buttery undertone, not all regular caramels taste of butter, and I didn’t miss the butter flavor. I also didn’t notice any extra porkiness from the lard. Instead, they were sweet with a strong ginger bite. They were sweet and spicy but not painfully so, though I did get just a hint of burn in the back of my throat. I thought these were a highly enjoyable tasty and unique treat. I don’t think I’d buy these again because ginger has never been my thing, but I did enjoy trying them. An O.